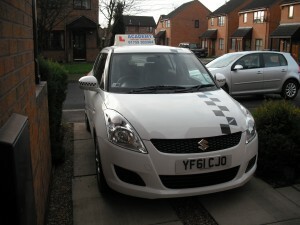 We will arrange a suitable place to pick up, Usually home, work or college. We recommend that where possible 2 hour lessons, this will be more beneficial due to traffic conditions. There will be no car sharing. What’s the best type of course for me? That depends on what you want. Some people choose to – or need to – take a driving course in a short time, while others prefer to spread their training over a longer period. We explain the courses we offer. Special offers available for Students and block bookings – call to find out more as these change frequently! 17th Birthday ? Call now to find out about our special Birthday offer ! For the majority of people, having hourly lessons maybe once or twice a week may suit them. They can spread the cost of the training over some months. These can be one hour or two hour lessons. The advantage of 2-hour lessons is that you will get more learning time as you will not spend half of the lesson driving to and from the training areas. Hourly lessons allow you to plan your life around the lessons. Another advantage is that you’re not under any pressure to take the tests. Both you and your trainer can decide when you’re ready. You also have time to have private practice if someone is available for you to help. This type of course is designed for those who wish to take at least 4 hours a week. The advantage of this type of course is that you should be ready for your test in a shorter period of time. If you book and pay in advance for 10 hours or more we can offer a discount on our normal lesson rate. Has it been a while since you last drove a car? Just passed but still a little unsure about certain aspects of driving? Perhaps it’s motorway or night driving? Then this refresher course is perfect for you.